Apple should focus on the inside -- not the outside -- of the car when it comes to artificial intelligence. Last week, we reported on the autonomous-driving partnership between Apple Inc. (AAPL - Get Report) and Volkswagen (VLKAY . Despite being two of the largest companies in their respective industries, the current partnership is rather dismissable. As it stands, Volkswagen is producing T6 Transporter vans, which Apple is using to retrofit with its self-driving sensors and software. It's not for commercial development or consumer use -- at least not yet. It will be used to transport Apple employees between its headquarters. Even that project is unlikely to be finished this year, according to sources. While Apple and Volkswagen could build to a more meaningful partnership, it's been slow going. Apple has always been pretty secretive with its projects and its autonomous driving work is no exception. That being said, details have leaked over the years that paint a rather scattered picture. Specifically, Apple has had trouble going at it alone, struggling to decide whether to build its own fleet or simply make the software. Then it had trouble finding a partner when it opted not to build its own vehicles. Now we're watching as Apple struggles to put a self-driving car in a mostly closed environment, while others like Alphabet's (GOOGL - Get Report) (GOOG - Get Report) Waymo is launching an autonomous taxi service in Phoenix this year. General Motors Co. (GM - Get Report) , Ford Motor Co. (F - Get Report) , Uber and others aren't too much further behind. 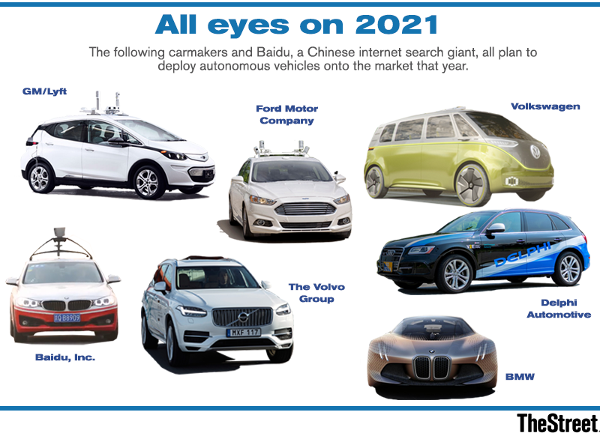 Others like Nvidia Corp. (NVDA - Get Report) and Intel Corp. (INTC - Get Report) -- just to name two -- look as if they'll play big roles in the future of autonomous driving as well. In that respect, it's hard to see so many big tech companies involved in autonomous driving and Apple comfortably sitting behind as a noticeable laggard. By the way, Apple, Alphabet, Nvidia and Amazon (discussed later) are holdings in Jim Cramer's Action Alerts PLUS Charitable Trust Portfolio. Of course, it's very early in the autonomous driving race. But that doesn't mean Apple should let its competition get too far ahead of it. After all, at some point they may not be able to catch up. Short of acquiring an automaker or big-tech company already making inroads, though, what should Apple do? According to the California DMV, the number of Apple autonomous cars registered in the state has more than tripled since January -- albeit from 27 to 88, but it's a start. At this point, though, I wonder if Apple should even pursue autonomous driving? The company has the financial firepower to be a leader in the area, practically overnight if it were that committed. Instead, maybe it should focus on the inside of the car. After all, Apple is used to controlling the customer experience, right? It's all about ecosystem. Well, rather than going through the arduous task of building an entire self-driving car system -- seriously, do you know how hard and time-consuming that is? -- why not focus on the cabin. Back in January, I caught up with Danny Shapiro, the senior director of automotive at Nvidia. He walked me through some of the awesome features that come with having a car with artificial intelligence fused into the infotainment portion of the car. Going in this direction would allow Apple to bring Siri to the car; it could have Apple Music and/or iTunes as the preferred entertainment source and could easily place calls or text via the driver's contact list. Yes, there's CarPlay, but Apple could take it so much further and push the boundaries with A.I. There are so many granular things that Apple could do better than the average automaker when it comes to in-car entertainment and convenience. Bit by bit, it may not make much of a difference. But if Apple were to control a bulk of it, it would have a lot of potential because of the attractive user interface it has on other products. Some very well might not love it. After all, Siri isn't exactly winning any awards from consumers, especially compared to Amazon.com, Inc.'s (AMZN - Get Report) Alexa. But there's no reason that Apple couldn't improve Siri. With 17.5 million new auto sales each year in the U.S. and almost 100 million new vehicles being sold globally, the industry is ripe with opportunity. Plus, Apple can fuse what it does best -- software and interface -- with the new world of A.I. What the new Nvidia-powered Mercedes MBUX infotainment system can do is quite impressive and Apple could apply something similar to so many different makes and models. While some automakers may want to control that customer experience themselves, there's little doubt that Apple could do a better job than many out there, especially in these early innings of A.I.